Apart from the storage of our basic necessities like clothes, shoes and grooming accessories there is always a roar for the storage of some secondary important items like photos, your books, and some collected pieces of show piece items. And for this purpose, shelves are the best way to cope with the storage problems efficiently. 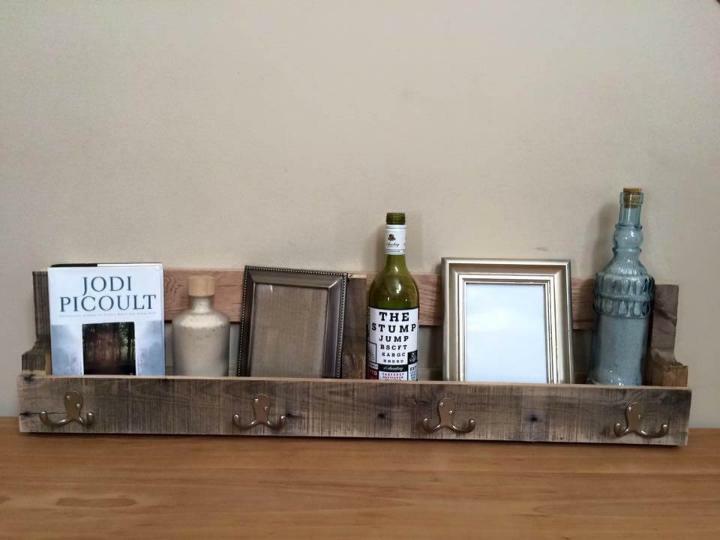 And with pallets you can built a personalized and apt shelf for your house that would allot your house beauty and embellishing when mounted on the walls. 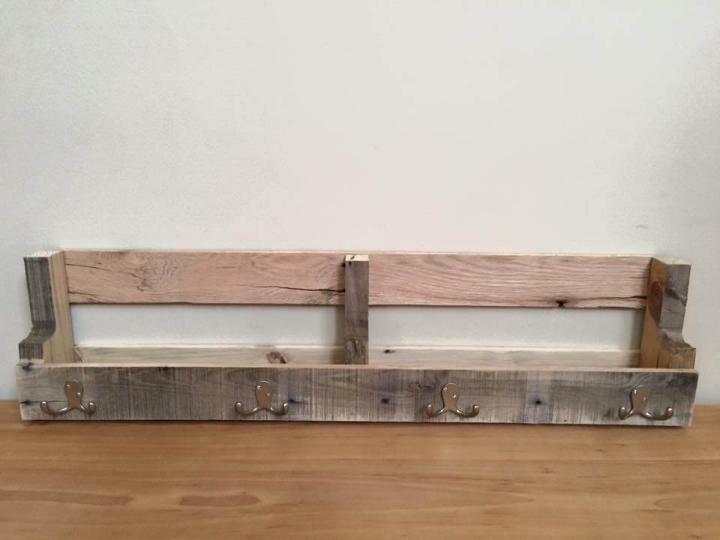 Here you go with a nice DIY Pallet shelf with metal hooks, that has been created from the pallet wood so that it does not let even a single penny slip out of your pocket. The shelf presents a very sleek and compact design that would no take up a lot of wood as well as a lot time from your busy schedule for its functional possession. 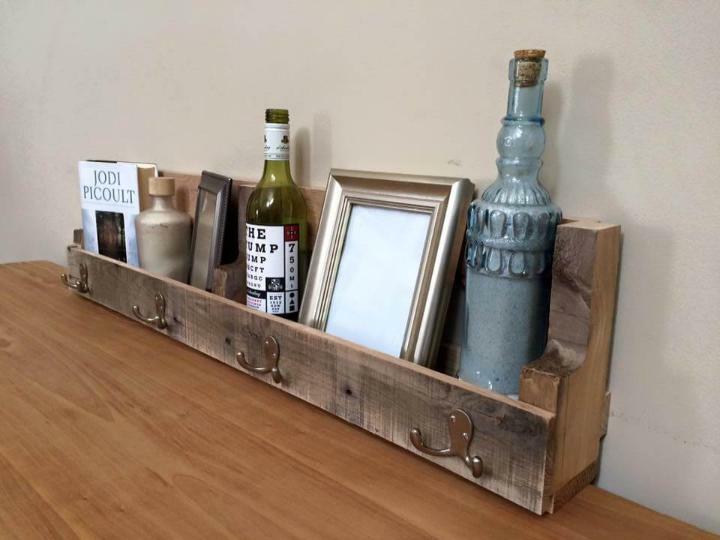 Staining can bring more stylish and glam perspective to the shelf as well as your home decor and also get more 150+ Wonderful Pallet Furniture Ideas here to for your home. Pallet shelves are the best way to show case your home embellishing pieces like the artifacts, vases, flower pots, frames and lot more so build this cute and functional shelf out of pallets for a cost efficient project. The shelf has been made to perform double functional roles one is to behave as a rack for the holding of some utilities in it and the other one is the hanging of your stuff on the hooks so do copy this amazing idea. 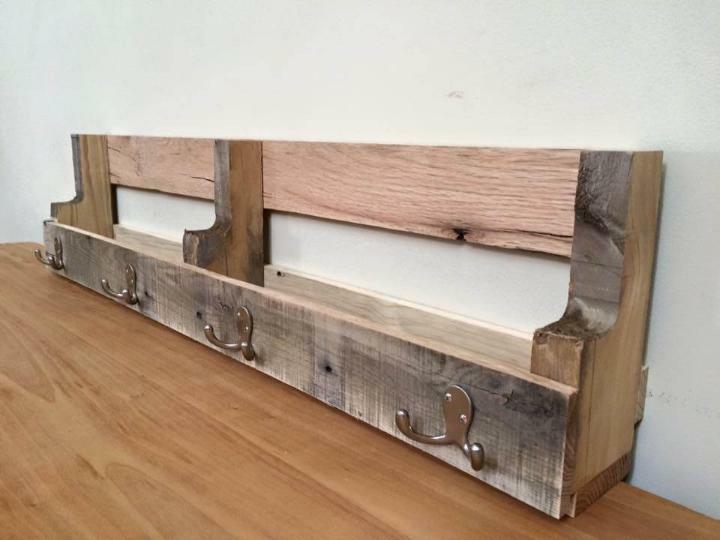 The pallet shelf has been built very easily using slat pieces of the of pallet a few in number and stacked quite nicely to each other using nails and wooden glue at the joint section of the shelf and screws have been used for the insertion of the hooks. The shelf would be mounted up high on the walls thus saving your space and would add a very eyeful touch to the empty and blank walls. The shelf would suit both an entrance, hall, living or even a bedroom wall.